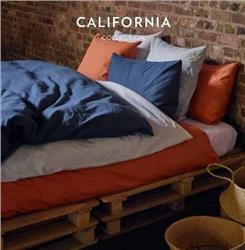 The CALIFORNIA bed linen combines the luxurious feel of linen with the familiar comfort of cotton. Only the highest quality flax and cotton fibers are selected to create a strong and long lasting bed linen collection. A linen-cotton blend available in 8 colors: optic white - pale rose - lemon - bittersweet orange - strawberry - iceberg - aqua green and blue rhapsody. This collection offers: duvet covers + shams and is also available as set. 51% linen + 49% cotton. twin size 70" x 86"
Full/Queen size 88" x 92"
King size 106" x Shams i2D"
king size 21" x 37"